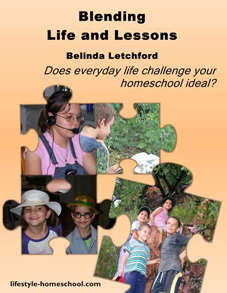 Does everyday life challenge your homeschool ideal? Do you have days that are just so hot swimming seems to be the only thing to do? Your family life will differ from mine, but you get the idea – life brings its interruptions and there are days when we just wish the world would stop so we could homeschool! It wasn’t until I changed my mindset, the things that happen up in my head, that I could see these so called interruptions for what they truly were. I would like to share with you my journey: the thought processes and the mind-washes that have been necessary as I started to change my mindset about having my children at home. As I share my stories and the things that have helped me, I hope to inspire you to see that discipling your children can be done in today’s busy life. Find that balance in your family.